composition during this reaction is called catalysis. 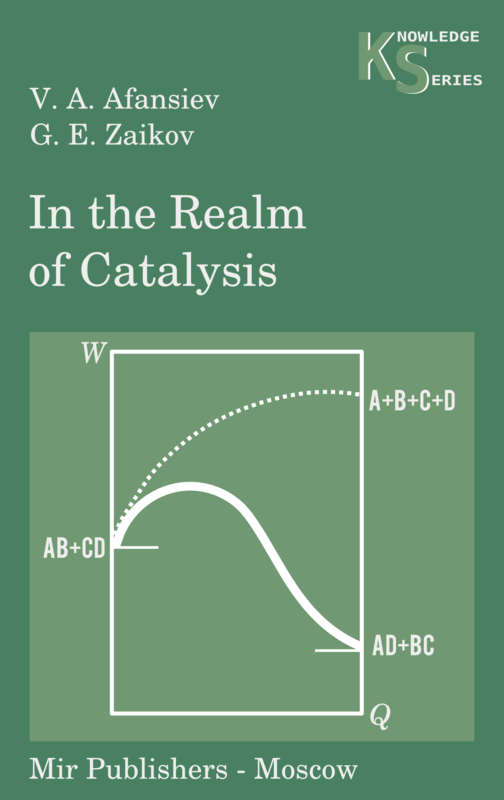 In this post we will see the book In The Realm of Catalysis by V. A. Afanasiev and G. E. Zaikov. This book is part of Knowledge Series, some of titles we have seen earlier. In this popular narrative we have attempted to unveil some ‘secrets’ of catalytic reactions and to provide illustrations which are more closely related to our own field of research. We have placed special emphasis on the kinetic principles of catalysis. In the discussion of catalysis we considered it necessary to give the reader the basic principles of the theory of chemical catalysis and gave examples of catalysis in biology and in industry. It was not our aim to discuss all aspects of catalysis in chemistry and biology, and in this respect this book is far from being comprehensive. The book was translated from the Russian by Alexander Rosinkin and was first published by Mir Publishers in 1979. This entry was posted in books, chemistry, engineering, life sciences, mir books, mir publishers, science, technology and tagged catalysis, catalysts, energy barrier, enzymes, heterogeneous, homogeneous, industrial, model reactions, rate of reaction. Bookmark the permalink. Thank you for this beautiful book. Seventeenth chapter of the book has been removed(!). @nikhil, The internet archive link works fine.